God, I love Clueless. Who knows how many times I’ve seen it. I remember going with my mom to pick up my sister from the theater when she saw it, and seeing the bright neon credits and thinking it was so cool. Then we had it on VHS, then DVD, and now it’s on Netflix. Although Clueless ages itself by being so firmly set in the 90’s, it still ages extremely well, I think. Or maybe I’m biased because I’ve seen it so many times. But still. And it is kind of incredible just how 90’s Clueless really is. The soundtrack is awesome, but super 90’s. The Mighty Mighty Bosstones are in the movie. The fashion is insane; from grungy to bright short skirts. But what’s crazy is that even though most of the characters are dressed like crazy people, I remember how insanely cool they all looked at the time. As a kid I was sort of fascinated with 80’s fashion, because I couldn’t imagine anyone genuinely dressing like that and not feeling like they were wearing a costume. I also thought it was sort of a shame that I was living in a time period without a distinct fashion sense. I thought no one would ever look at a past outfit and think “That is so 90’s.” How wrong I was. 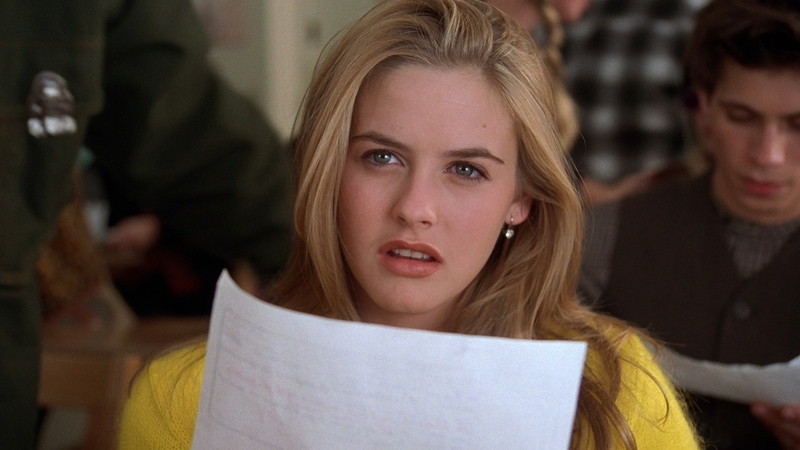 Everyone in Clueless is top notch. It does a great job of poking fun without being super mean. The whole cast is at the top of their game here; of course I don’t mean they’re all at the height of their careers, but everyone is just so good and funny. It’s great to see well-known actors as young actors, still doing a good job. And except for King of the Hill, this is clearly the best thing Brittany Murphy ever did. Clueless also stands as evidence that there’s no way Paul Rudd did not sell his soul to the devil to remain ageless. I remember seeing this in high school in my first film class. What I remember the most was thinking how forgettable this movie is. As an adult, this movie really is great! It’s pretty funny and it’s really weird how Paul Rudd doesn’t age. I know this movie is based off of the book Emma but I have never read it. After seeing this it definitely is on my list! What worked best to me was Brittany Murphy in this. It’s definitely because I’ve been watching a ton of King of the Hill but throughout the movie I just kept on thinking Brittany Murphy was playing Luanne! I’m very glad I watched this movie again. It was something I had cast off as not very good but I guess this is another reason why getting older does have its benefits. Clueless is one of my favourite films of all time! The soundtrack is fantastic and I play it regularly now. I also had this on VHS so that ages me a bit lol As much as I love this film, it makes me sad at the same time as Brittany Murphy was taken much too young and I still can’t believe at times that she’s no longer here. I love her performance in this and equally in Girl, Interrupted.